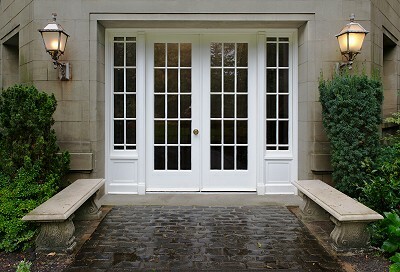 CR Doors is proud to sell some of the finest custom Stained Glass doors and Stained Glass Windows. Designs for stained glass are often inspired by plants, animals, people, landscapes and flowers. You can enhance your home, or workplace, with stained glass art in your custom window or door. CR Doors would be happy to design and build the custom stained glass fixture of your dreams. Historicaly colours were painted onto the glass and placed in a furnace to anneale. Today "stained glass" is often manufactured diffrently with the metallic salts and oxides forged within the glass. Thereby coloring the glass completely through, and requiring no color application. Modern glass artist simple cuts sheets of color and uses it to form a window. To create a stained glass window, the artist first places his design on paper to determine colors and cutting, avoiding shapes which could easily break or would be impossible to cut. Usining the paper pattern, the glass is cut into the shapes. The glass pieces are then put into place like a puzzle and fastened with lead strips. Once placed, the lead strips are soldered together to create a secure and weather-tight window. Stained glass requires a skilled artist, who is able to not only conceive the design, but understand the engineering skills necessary to assemble the decorative piece so that it is capable of supporting its own weight and survive the elements. Modern techniques include: designing, painting, beveling, staining, enameling, acid etching, sandblasting, glass bending, glass sculpting, restoration, fusing, lead came assembly, copper foil technique and more.